What is the iPro CRM accommodation software? iPro software was custom designed for the holiday rental industry, with customer relationship management (CRM) as a pivotal software feature. By managing all of your business’ interactions and relationships via a CRM, you can streamline your processes via automation and build an in-depth understanding of the customer journey. For instance, who a customer is, how long they have been using your services and how many times they have booked accommodation. A property management CRM will guide you in your contact, marketing and sales management, and so help you to develop your lead nurturing process. 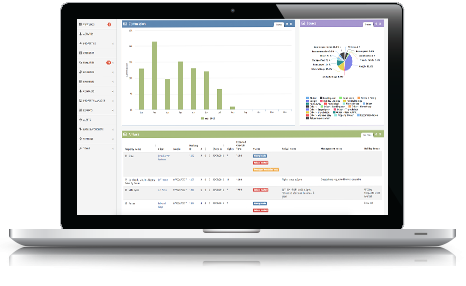 Fundamentally, our CRM software will provide you with real-time business intelligence, which is key to business growth and success. The iPro CRM system will give you key insights into your progress towards your business goals and objectives, This allows you to adapt your strategy accordingly with your own reliable, up-to-date data. Within the reports section we have created bar charts, pie charts and line charts so you can easily analyse trends and see identify where where your growth is coming from. Your personalised dashboard allows you to save the core reports that are applicable to you alone, so you have all the information you need at the tip of your fingers! Without a CRM system, a lot of your time will be spent doing administrative processes for your holiday rental business, which will likely involve manually entering information received from different platforms such as email, phone and website enquiries. By integrating a PMS CRM, all of this data can be collected into one common platform, and so enable you to become more time efficient. Triggering alerts - the information can be pulled from a variety of sources, e.g. incomplete information, an email trail, payment status, or date of booking. This is dependent on what you wish! A helping hand - Upon signing up for iPro CRM software, you will be assigned an iPro project manager who will help you configure what automation/alerts you need based on your business model. You can then update, amend or add to these anytime you wish. Just head to your personalised control panel! Use the email template builder to respond quickly and efficiently to customers. With thousands of templates available, you can create a huge variety of preset templates for your staff to use. These presets can then be easily saved, logged or amended to send the appropriate reply.